I'm actually interested--what kind of surface do you use to block? Back when I made this sweater, I think I was just laying out towels on the floor and pinning the sweater pieces to it. Which doesn't work very well! But now I have a set of homemade blocking boards made from homosote covered in muslin. They are better, but it's really hard to push pins into the homosote. 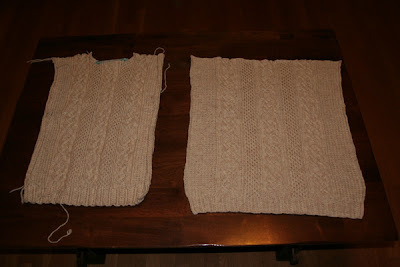 A professional blocking board is probably not a bad investment if you see more sweaters in your future!